Dawn is now beginning intensive observations of the alien world it orbits. The approach phase, which began on May 3, is complete. Today Dawn is in its survey orbit around Vesta. Following the previous log, the spacecraft continued using its ion propulsion system to spiral around Vesta, gradually descending to its present altitude of 2700 kilometers (1700 miles). Its flight plan included more observations of Vesta, each one producing incredible views more exciting than the last. Every image revealed new and exotic landscapes. Vesta is unlike any other place humankind's robotic ambassadors have visited. To continue to share in the thrill of discovery, remember to visit here to see a new image every day during survey orbit. Your correspondent, writing with atypical brevity, also will continue to provide progress reports here at least once a week. As the ship sailed ever closer to the massive protoplanet during the approach phase, the gravitational attraction grew stronger. We saw in previous logs that astronomers had estimated Vesta's mass by observing the effect of the 530-kilometer (330-mile) diameter behemoth on distant bodies, including smaller residents of the asteroid belt and even Mars. Now that navigators can detect its pull on nearby Dawn, they are improving that value. Before the explorer's arrival, Vesta's mass was calculated to be about 262 billion billion kilograms (289 million billion tons). Now it is measured to be about 259 billion billion kilograms (286 million billion tons), well within the previous margin of error. It is impressive how accurately astronomers had been able to determine the heft of what had appeared as little more than a point of light among the myriad stars. Nevertheless, even this small change of 1.2 percent is important for planning the rest of Dawn's mission. With this superior knowledge of the strength of Vesta's gravity, navigators now estimate that the giant asteroid took Dawn tenderly in its hold at 9:48 p.m. PDT on July 15. They will spend the next year together. 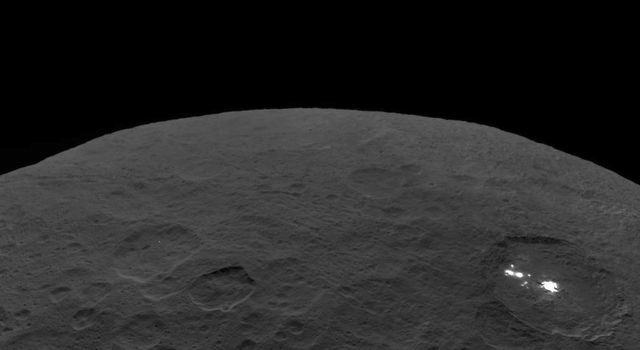 From Vesta's point of view, its visitor approached from the south. Shortly after the previous log, Dawn passed over the south pole and then arced north as its orbit carried it over the unilluminated side of Vesta. It continued its graceful, spiraling descent until July 22 when it was about 5200 kilometers (3200 miles) above the rocky surface and coming within view of the day side in the northern hemisphere. As it curved south and flew over Vesta's illuminated face, it stopped thrusting to conduct its most extensive set of observations yet. At that altitude, it would take a full week for the spacecraft to complete one orbit, so the pace was not rushed. During four sessions over the next three days, Dawn viewed the world beneath it, turning after each one to beam its findings back to Earth. The first occurred in the northern hemisphere, which was of particular interest because the preceding pictures were centered deep in the southern hemisphere. In the original plan for this time late in approach, Dawn would observe Vesta three times during its passage over the bright side. The second of the sessions would be devoted to collecting images throughout a complete Vestan day of 5 hours, 20 minutes, just as the probe had done twice before during the approach phase from greater distances. Because watching Vesta for an entire rotation was so important, and recognizing the many challenges in acquiring such data, mission planners decided to schedule a backup observation, bringing the total to four during this coast period on the way to survey orbit. The first rotation observation was performed with Dawn near Vesta's equator. The backup occurred 15 hours later, by which time the spacecraft had moved to latitudes about 30 degrees farther south. That was followed more than 30 hours later on July 25 by additional photography over the far southern regions. All planned observations were completed successfully, providing magnificent views of the complex surface and showing once again that further exploration promises many more exciting rewards. The rotation observations included not only the standard black and white images but also the use of all of the science camera's color filters, providing tantalizing hints of how varied the surface is. In addition, the visible and infrared mapping spectrometer (VIR) collected a rich set of spectra throughout both Vestan days. Spectacular as the pictures and spectra are, they are not the objective of the mission; still better views are desired and will be obtained soon. With that in mind, thrusting resumed on July 28. 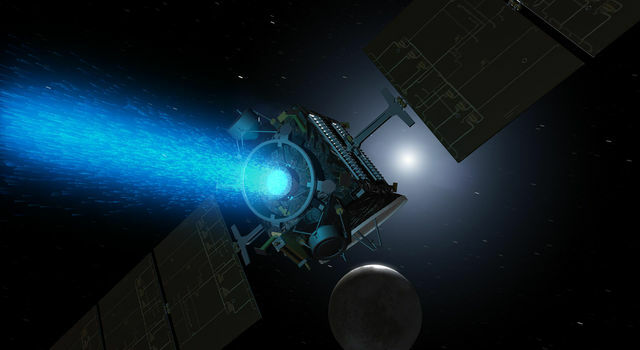 Since June 30, Dawn has been propelling itself with ion thruster #2. On June 27, while operating with thruster #3, an ion propulsion system electronics unit that controls the valves used to regulate the flow of xenon to the thruster stopped working. The operations team responded with swift professionalism to keep the mission on course and schedule. In addition to reconfiguring the spacecraft from its safe mode, swapping to another control unit and thruster #2, and devising a new flight plan, the team conducted a thorough analysis of the circuit that misbehaved. The best explanation for its inability to send electrical signals to the valves, as well as for all the other detailed telemetry the spacecraft provided to engineers, was that a component in the circuit had been struck by a cosmic ray, a high energy particle of space radiation. Experts also concluded that the circuit would operate correctly again once the unit was powered off and powered back on. After careful consideration of whether there might be any risk to the electronics or to other systems onboard in reactivating the controller, the team devised a plan to turn it on and test it. On July 20, when Dawn was conducting a routine communications session over the night side of Vesta, they transmitted the instructions to the spacecraft and were rewarded with a fully functional control unit that operated as well as ever. Although the mission certainly could have been completed without restoring this device, having it available again provides greater robustness and makes flying the spacecraft easier. When ion thrusting resumes on August 31 to begin spiraling from survey orbit to the next science orbit, this controller will be used again with thruster #3. At 12:07 a.m. PDT on August 2, Dawn reached its targeted orbit. Although entering orbit around Vesta was an extremely important milestone for the mission, reaching survey orbit is of even greater significance. It is here that Dawn will focus on doing what it was conceived for: exploring an ancient protoplanet to provide new insight into the dawn of the solar system and its present nature. To get here from Earth, the spacecraft traveled more than 2.8 billion kilometers (1.7 billion miles) in nearly four years. It accumulated two years, eight months of ion thrusting, during which it expended 252 kilograms (556 pounds) of its xenon propellant. That enabled the spacecraft to achieve the equivalent of 6.8 kilometers per second (15,200 mph) after leaving its Delta rocket behind. This is almost two thirds more than any other spacecraft has achieved under its own power. Orbiting Vesta, which Dawn has now accomplished, would have been unaffordable within NASA's Discovery Program with conventional propulsion, and a mission to both Vesta and Ceres would be impossible. The exquisitely gentle touch of the ion thruster that allowed the patient spacecraft to reshape its orbit around the sun, and then around Vesta, was as silent as space itself, but if we imagined that it made a sound, it would be the faintest of whispers, the softest of sighs. Yet it tells us the secret of making an interplanetary spaceship that can travel to and explore distant, alien worlds, carrying with it the dreams of those on Earth who long to know the cosmos. Even after the spacecraft arrived in the planned orbit, mission controllers continued preparing for the survey orbit phase. Navigators tracked the probe as it looped slowly around Vesta, refining their measurements of the orbit for use in timing the observation sequences and telling the spacecraft exactly where to aim its sensors. With the latest approach results in hand, engineers and scientists updated parameters for the camera and VIR, essentially tuning the instruments to ensure they will perform at their best. For example, a few areas of Vesta were found to be somewhat brighter than anticipated, so the effective shutter speed of the camera needed to be reduced slightly. While controllers were putting the finishing touches on the survey sequences, Dawn acquired its final set of approach phase observations with the camera and VIR on August 5 - 6, returning the best images and spectra yet. On August 8 the team set the spacecraft's main clock to the correct time. Reflecting the more casual nature of operations during interplanetary cruise and approach, they had allowed the clock to drift off by 0.37 seconds, but such insouciance is no longer appropriate. 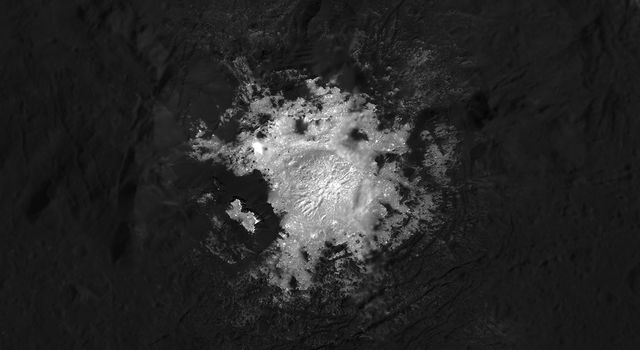 The detailed surveying of Vesta was designed to begin when Dawn passed over the boundary between night and day in the northern hemisphere, known as the terminator. Following the completion of all the exacting work by the mission control team, the sequences were transmitted to the spacecraft, where they waited until the probe was correctly positioned at 9:13 a.m. PDT on August 11 to delve into its work. Each survey orbit lasts about 69 hours, or nearly three days. Dawn will spend most of the time over the lit half aiming its instruments at the surface to acquire data. While over the dark half, it will point its main antenna to Earth to radio its findings back to the Deep Space Network. When the plan was described last year, the survey orbit phase lasted for six revolutions, which included acquiring much more data than needed. As with the rotation observations, mission planners had scheduled backups so that even if some are not obtained, it is likely there will be enough to avoid complex and rapid replanning in the event of glitches. The principal change since the previous description is that they have added one orbit, ensuring an even more resilient plan for this vitally important phase of the mission. Dawn is beginning to fulfill its destiny in service of humankind's collective passion for knowledge. With the amazing images and other data returned so far, the Dawn project is gratified to say, "Earth, meet Vesta!" Now we are about to really get to know our new acquaintance. Dawn is 2700 kilometers (1700 miles) from Vesta. It is also 1.24 AU (186 million kilometers or 115 million miles) from Earth, or 480 times as far as the moon and 1.22 times as far as the sun today. Radio signals, traveling at the universal limit of the speed of light, take 21 minutes to make the round trip.